The Book of Mormon’s rich accounts of warfare in the first century BC contain some of the most exciting and interesting material in the thousand-year narrative. The stories are replete with battlefield strategies, various military maneuvers, topographical awareness, innovative fortifications and weaponry, concerns over provisions, military intelligence, and even covert, late-night operations. These narratives have captured the imagination of Latter-day Saints of all ages, from young boys in primary to popular fiction writers. Perhaps less recognized, these chapters have also caught the attention of those some with both academic and professional military expertise. It is real war that we see here, a tedious, sordid, plodding, joyless routine of see-saw successes and losses—brutally expensive, destructive, exhausting, and boring, with constant marches and countermarches that end sometimes in fiasco and sometimes in intensely unpleasant engagements. Nibley felt this kind of war could only be described by someone who experienced it. The author writes as one would write—as only one could write—who had gone through a long war as a front-line observer with his eyes wide open. Everything is strictly authentic, with the proper emphasis in the proper place. Strategy and tactics are treated with the knowledge of an expert … it is all there. Many aspects of military theory are universal across time and space. Nonetheless, proper understanding and expertise in the strategy and tactics of war requires years of study, extensive training, and real-life experience. Joseph Smith lacked that kind of background, yet several modern readers with just such qualifications have found that the Book of Mormon accounts of wartime strategy are strikingly realistic. According to Spencer—who has been involved in creating battle scenarios for training purposes—this kind of accuracy was beyond the ability of Joseph Smith to fabricate. This is the sort of unconscious consistency in war accounts that would be almost impossible for someone writing a made-up story—as Joseph Smith has been accused of—to get right. And yet the Book of Mormon gets them right repeatedly. See Hugh Nibley, Since Cumorah, The Collected Works of Hugh Nibley: Volume 7 (Salt Lake City and Provo, UT: Deseret Book and FARMS, 1988), 291–333; Hugh Nibley, “Warfare and the Book of Mormon,” in Warfare in the Book of Mormon, ed. Stephen D. Ricks and William J. Hamblin (Salt Lake City and Provo, UT: Deseret Book and FARMS, 1990), 127–145; William J. Hamblin, “The Importance of Warfare in Book of Mormon Studies,” in Warfare in the Book of Mormon, 481–499, reprinted in Book of Mormon Authorship Revisited, ed. Noel B. Reynolds (Provo, UT: FARMS, 1997), 523–543; John E. Kammeyer, The Nephite Art of War (Far West Publications, 2012); John E. Kammeyer, Warfare in Mesoamerica: Battles in the Book of Mormon (Far West Publications, 2012); Douglas J. 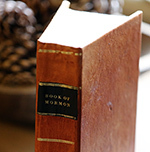 Bell, Defenders of the Faith: The Book of Mormon From a Soldiers Perspective (Springville, UT: Cedar Fort, 2012); Mogan Deane, Bleached Bones and Wicked Serpents: Ancient Warfare in the Book of Mormon (self-published, 2014); David E. Spencer, Captain Moroni’s Command: Dynamics of Warfare in the Book of Mormon (Springville, UT: Cedar Fort, 2015). For Nibley’s time in the military, see Boyd Jay Petersen, Hugh Nibley: A Consecrated Life (Salt Lake City, UT: Greg Kofford Book, 2002), 167–222. Kammeyer, The Nephite Art of War, PDF p. 182. Hamblin, “The Importance of Warfare in Book of Mormon Studies,” 496. For what Joseph Smith could have known about military theory, see Kammeyer, The Nephite Art of War, chapter 1. For his experience making-up battle simulations, see Spencer, Moroni’s Command, 4. See Deane, Bleached Bones for application of Book of Mormon war principles to modern military practice and policy. For Latter-day Saint perspectives on war, see Patrick Q. Mason, J. David Pulsipher, and Richard L. Bushman, eds., War and Peace in Our Time: Mormon Perspectives (Salt Lake City, UT: Greg Kofford Books, 2012); Duane Boyce, Even unto Bloodshed: An LDS Perspective on War (Salt Lake City, UT: Greg Kofford Books, 2015).